So, I'll admit, I was wigged out about the serial casting. Mostly because I was worried about how Max would handle it, but also because I've been generally anxious about his right foot. It's noticeably turning in. I'm full-blown scared the casting won't work and all those years of Max walking relatively fine are going to be history, after all that he's gone through to get there. Walking is Max's special needs strength, his "Screw you, NICU doctors—you were WRONG" trump card and mine, too. These are the thoughts that kept me tossing and turning last night. I was a zombie today. I don't know how Max has managed to keep walking around lately without falling everywhere, but that's Max for you, determined and cheerful. I hadn't talked with him much about the casting. I showed him a photo of a cast and told him he'd be getting one to make his foot straighter. "Ur-ul!" Max said, and I didn't dare let him know he wasn't getting one in purple. I made Dave take him for the casting. I didn't want Max to pick up on my anxiety. But also, I was being a weenie: I thought I'd get really upset if he got really upset. Dave is of the anxiety-free variety of human beings. He doesn't worry about stuff like, say, whether Max is going to wig out because the fabric shoe that fits over the cast is blue, not purple. He doesn't obsess. He just blithely forges ahead. So this afternoon, Dave took Max to the physical therapy center at a local children's hospital for serial casting. And I called ten times in a row to make sure everything was going OK. No response. Email #1 subject line: HONEY, IS MAX OK? Email #2 subject line: HONEY, IS HE CRYING? Email #3 subject line: WHAT IS GOING ON?! Email #4 subject line: DAVE! EMAIL OR CALL! And I felt relieved to see the cast didn't look too clunky, but also kind of sad to see Max's cute little toes poking out of it. Max was a trooper. That emotional maturity I mentioned yesterday surely helped. He cried a little, but then the therapist put on a Cars DVD and he calmed right down. Dave had found him a new purple car at Target, which also helped. Max didn't even seem to care, Dave reported when we spoke, that the cast was white. 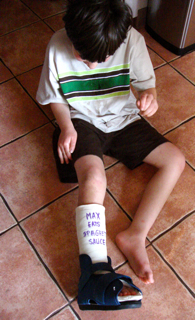 "He actually asked if he could a cast on his other foot, too," Dave said. I ran out to the local pet store to pick up some of that pet wrapping tape Hyper Aspie told me about yesterday (THANK YOU!). Mercifully, it came in purple, and I got my son two roles of flexible bandage from a company that bills itself as "The future of pet health." The checkout counter had a dog tag display. One was labeled "Max" and I took it as a sign that 1) Max was going to be OK and 2) there may be more dogs named Max than kids named Max, something I've long suspected. Then I got myself a box of Petite Cocoa Batons from the Trader Joe's next door, because being a neurotic, anxiety-ridden mom is hard work. Max is usually gleeful when I walk in the door, but he was particularly pleased to see me this afternoon. He kept pointing to his foot and kissing me. "Wow, that looks cool!" I said. "Did it hurt?" "Nooooo!" said Max, flashing me a smile. I got to work on the cast. First, I whipped out a purple Sharpie, and Max squealed. And he was quite pleased. Then we went upstairs and got ready for bed, and part 2 of the cast makeover continued. I whipped out the roll of purple pet tape. Max squealed even louder than before. "MY foot hurts!" said Sabrina. "I have a mosquito bite!" she said, and showed me the tiny bump. So I swiped on some anti-itch stuff, then did up the cast. Project Runway people, ya got nothing on me. Next Tuesday night, we unravel this cast and Max gets a new one on Wednesday. Repeat for three more weeks. Pray that it works. But so far, so good. Max is sleeping peacefully. Me, I'm going to go eat some Cocoa Batons. quite fantastic! :) I hope Caleb can sign his name with a purple marker, too! Afterall, that is the fun part of having a cast - having your friends sign it! Max is a tough kid. With all that he's been through, I guess he doesn't have any other choice. But he has more strength than anyone else I know. Well, except maybe you and Dave. 2) (your) Max has super cute feet! Oh my gosh! 3) The purple additions to his cast are GREAT. ChaneyM: Sending in purple Sharpie to school tomorrow! Karen: Max has more strength than anyone I know too. lol, loved the story. I found myself chuckling several times. Nice to know you can find the humor in a rough situation! I think serial casting is super-effective based on brain science (I'm sure you've done the research, too) so good luck and I think he'll do great! I have been following your blog for awhile and just want to say, I think you are completely fabulous. I came across your blog in one of those terrible late night trawls through the internet. In my case I was searching for information on Cystic Fibrosis as my son (aged 4, nearly 5) is a 'CFer'. 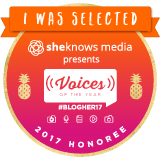 How I ended up at your blog I have idea, however, I am so glad I did. I love it! It is always the first one I open and so often it resonates - deeply! I am terrible at posting comments (this being my first) and am probably, officially, a lurker/stalker, however, I really want to announce myself as a huge supporter of you...all the way from New Zealand. My battles, highs and lows are a little different but some days, not so much. 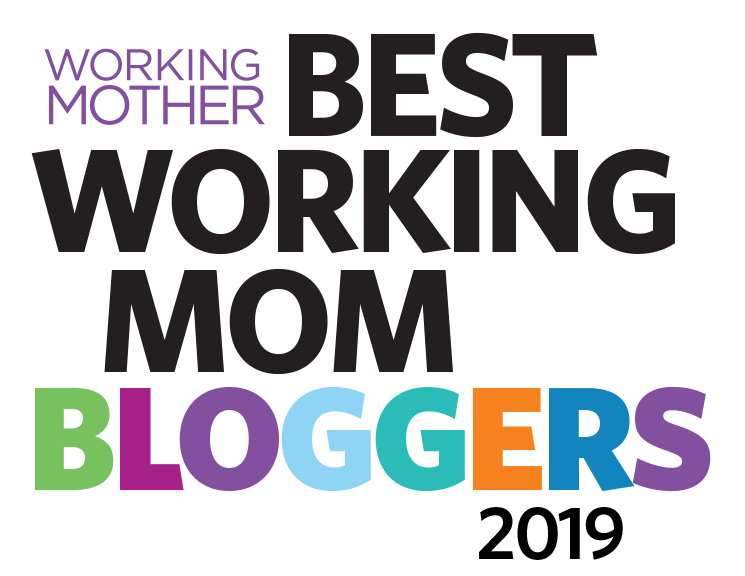 So, for what it is worth...I think you are the most fabulous, inspiring mum (mom!)! Welcome to the community Belinda! Ellen - glad it turned out ok and that it was only lower leg. 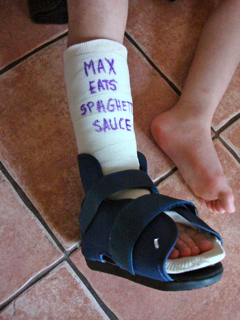 Nice work on the cast :) I will be praying for Max in the weeks to come. Yes, so far, so good. 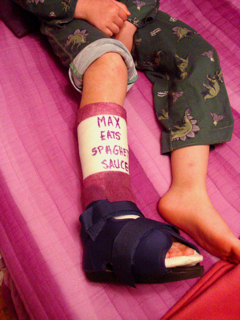 I just love that Max thinks his cast is pretty cool... He seems proud of it. I also appreciate that the doc provided support under Max's toes. Oia' toes just hung over the edge and that just doesn't seem comfy. Hang in there, hoping for good progress. Gabe does serial casting three or four times a year and it's SO much harder on us than it is on him. I bet he could get a purple cast if you asked-our PT's have all sorts of colors-even glow in the dark!! Yep, Max is the No. 1 pet name for like 10 years running! It's for people who don't have the guts to name their kids Max... same reason our cat is named Scout :) The cast looks great! Max is simply awesome - don't you find that our kids have this incredible strength and tenacity? and i agree, he has adorable feet! and you are an awesome mama, Ellen! Kudos for creaticity on the cast. I totally get the anxiety part. I always think that our children are such happy carefree kids and have no idea how much anxiety, sleepless nights, and energy we put into them...but thats the way it should be. We shouldnt burden them with our stuff, thats what self-medicating with chocolate is for. Shortly after I named Max I heard that Max was the most common name for male dogs in NYC. After Sam was born I read a list that put Max as the one name for dogs and Sam as number two! Ellen, you are an absolutely amazing, dynamic, creative, innovative mother who deserves all the chocolate batons she desires. Should Leo ever need casting, we might have a *green* challenge, but I will know exactly what to do, thanks to you! Ellen, I don't know ANY mother who goes the extra mile for her child like you do! What a lesson you are for any of us who have a heart and someone to love. Max is such a lesson too in dealing with the "negative". As far as Max is concerned, he has new, probably very expensive, purple footwear to show off. Lesson learned, Max, thanks! That's adorable! It's awesome how kids can deal with situations like that! I do the same thing when my kids have to go to the dr, etc. and make my husband take them, but text him the entire time. Eventually, I get the same one word answer (although I don't get a pic like you did). Max looks great, loved the pics. Great post (as always...). Wow! The moment I saw that pic of Max, I thought he looks just like my son. His hair is just like that. It's scary how much he looks like him in this pic. He got in trouble again on the bus and I had to go pick him up at school.This was when he was getting on the bus to go home. He couldn't make it through his last two days of school without getting in trouble! He is the one that drools that I'm always commenting about. He sure is a handful. This happened the day I came home from having a sleep study and on the way home my car part rusted through and started hanging down and dragging.Gosh my life is crazy! 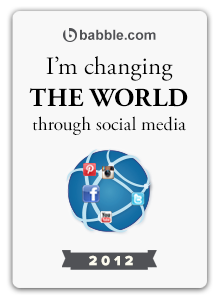 You're changing the world. You know that, right? 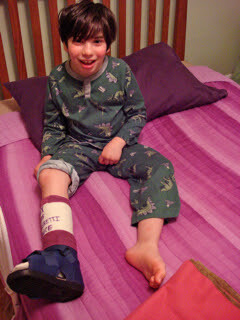 I am so glad it all went smoothly and Max is happy with his super purple cast. His happy little face just makes my day. The lengths special needs parents will go to! Good work! I love that you stayed home and let your husband go for the casting. Smart and good to allow someone else to take over once in a while. Thanks for the reminder. Fabulous!!!! 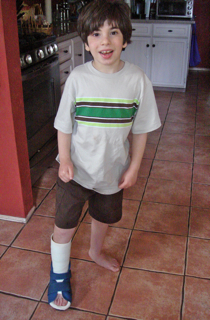 Our club foot kid had bent knee toe to groin casts. He was an infant, but even some of the older kids on our club foot list who are treated late (usually foreign adoption) or have relapses, learn to walk IN THOSE, so I'm sure Max will adjust!!!! Also, when serial casting is done right, it shouldn't hurt. 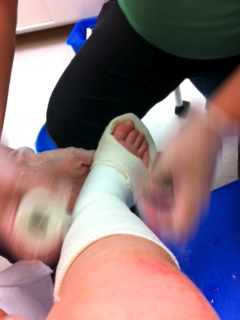 The foot is manipulated as far as it can go *without pain* and then cast. The range of motion will improve with each cast. Not sure with these, but with club foot casts we're advised NOT to remove them before the doctor's appt, to avoid regression between casts. Tiffany, that is so funny! Small world. I bought a bunch of rolls so I think we are good! Thank you for your purple kindness. Kristen, your comment floored me. Thank you. Marcy and Cheryl Faith, I think most moms of kids with special needs go the extra mile for their kids. I'm not anything outstanding in that regard, honestly. I just want Max to be happy. When he's happy, I'm happy. Getting him tricked out in purple is easy enough! aaahhhh... serial casting! My son has done it twice, and it is definitely tougher for me than him! Someone else already mentioned it, but it took me a while to remember that it doesn't hurt. It's not like a broken bone, you know? How disappointing that they didn't have colored casting material... choosing colors each week was a highlight for my son, as was making up crazy reasons for having casts on BOTH legs. 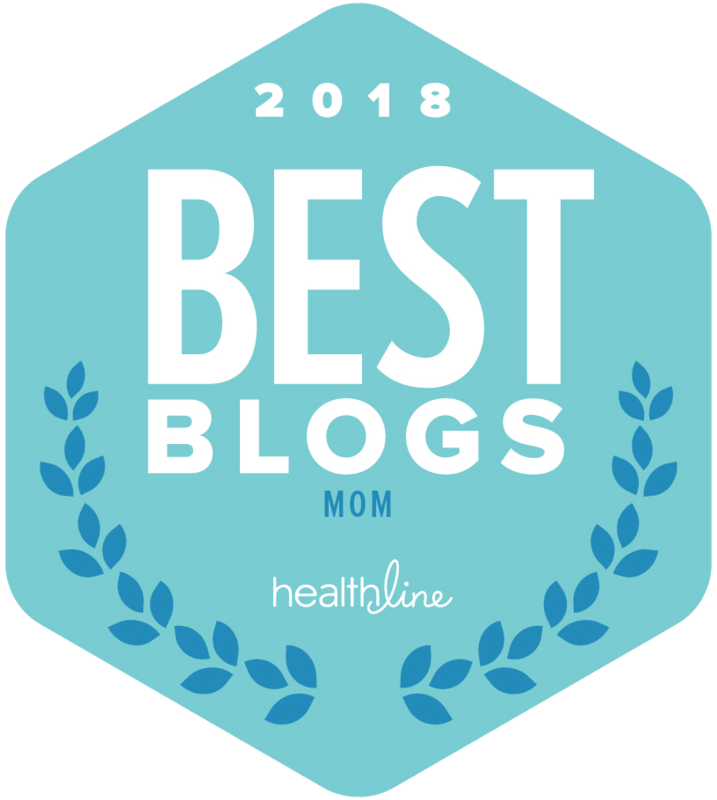 I clicked over from Scary Mommy - what a great idea you ladies had! !